Learn how to design and develop “real-world” classroom training programs. Training Design Basics celebrates the fast-paced, ever-changing reality of organizations today. Jobs, roles and expectations change quickly. One day you might find yourself a subject matter expert on a topic, and the next day you might be asked to train 50 people on your area of expertise. Training Design Basics is designed to be your one-stop solution for designing training programs. It is the perfect tool for new trainers, facilitators new to training design, and non-trainers taking on a training design role for the first time. Students will experience minimum lecture, and maximum hands-on instruction with a specific end in mind based on real-life workplace needs. 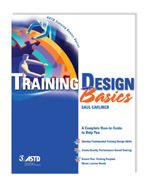 Students will receive the book “Training Design Basics” from ASTD Press, and will create a personalized training plan document that can be implemented in his or her workplace immediately.